Emerging technologies are increasingly impacting how and where we work. What could the near future bring for human resources and how can industry leaders create organizational cultures that thrive in our fast-changing future? 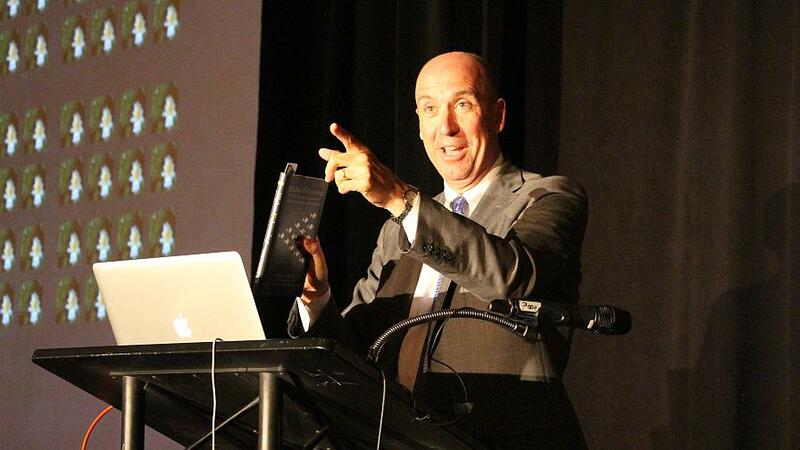 LOUISVILLE, Ky., August 29, 2018 – Global futurist and emerging trends expert Jack Uldrich is returning to Kentucky today to share his insights on the future of human resources with the Kentucky Society for Human Resource Professionals. Additionally, according to a study by the Kentucky State Data Center at the University of Louisville, between 2015 and 2040, the population of Kentucky is projected to increase by 10.4 percent (from 4,425,092 to 4,886,381). That will be a gain of 461,289 people. Artificial Intelligence (AI) is like the Industrial Revolution on steroids. It is poised to transform virtually every industry on a scale that will leave many people breathless. The human resources profession is no exception. Uldrich says the population increase alone is enough of a reason for Kentuckians to shift their mindset from linear thinking to exponential leap-taking. Uldrich encourages his HR clients to be aware of the emerging trends that will continue to radically shift both the urban and rural workforce. In his presentation today, titled Business as Unusual: How to Future-Proof HR Against the Top Workforce Trends Transforming Tomorrow, he will identify ten trends that are reshaping the future of human resources and the workforce of tomorrow. These trends include “gig” work, the sharing economy, and technological advancements in virtual and augmented reality, distributed ledgers, chatbots, wearable computing, the internet of things, and artificial intelligence. Today, he will share insights on how these advancements will change everyday life in the very near future, and how leaders in human resources can better position their companies for a future that looks very different than the world today. He will also address specific HR-related issues such as how companies and other organizations can attract and retain talent today and in the future. Uldrich is a frequent speaker on technology, change management and leadership and has addressed hundreds of corporations, associations and not-for-profit organizations on five continents. He speaks over 100 times each year, specializing in the transformation of healthcare, agriculture, education, energy, finance, retail and manufacturing. To learn more about Uldrich, his books, his daily blog, or his speaking availability, people are encouraged to visit his website.